When we went out yesterday morning to do chores we noticed that one of our pied peahens, Indra, was not feeling well at all. The area below her eye was so swollen that her eye on that side was completely sealed shut. It was shocking to see her go from looking completely normal the day before to having this swollen mass below her eye. Clint, who splits his time between here and looking after his parents almost two hours away, was at their house this weekend, so he wasn’t able to offer very much help. Both my mother and I are used to tackling health problems that are specific to the chickens, ducks, peafowl, etc anyways (it’s sad to say, but most vets have a minimal knowledge of those animals), so we’ve both definitely grown more confident in our own vet skills. He did tell us that if we needed him to, he’d come home to help us. Luckily, we were able to handle it ourselves, and we isolated and began treating her. Apparently, sinus infections are fairly common in peafowl. If left untreated, a hard mass will form in the sinus cavity and will require surgery to remove it. That hadn’t happened yet with Indra since we caught it in time. I can already tell a huge improvement in her just after a day: the swelling has gone down a lot and she can open her eye, she’s less lethargic and has actually explored the quarantine pen today, and she ate a little of her food. We’ve had an unusually warm winter with 70 to low 80 degree temperatures most days, but last week a cold snap came through. We went from the high 70s the previous day to the 30s and 40s the next day. Plus, it’s been very windy lately. The soil on top of our hill is sandy and we live on a dirt road, and as you can imagine the wind has stirred up a lot of dust. I’m wondering if either of those things had anything to do with Indra developing an infection. 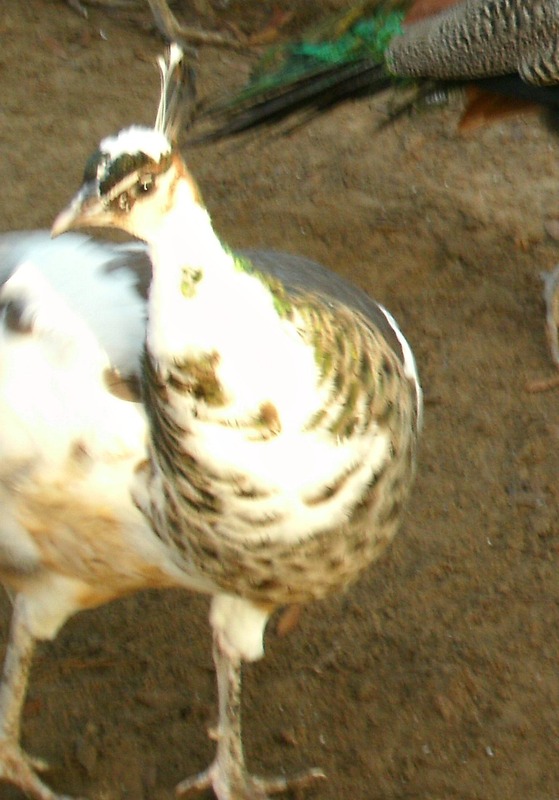 Just in case it spreads, we’re keeping a very close eye on the other peafowl. I did notice a very sweet thing about our peas when I went out to check on her last night. Indra’s mother, Hera, and her best friend, Sweet Pea, were sleeping on the ground at the very edge of their pen as close as they could get to the quarantine pen. It was almost as if they were keeping an eye on Indra. Then, earlier tonight when I checked on her, Hera and Sweet Pea were back in the same spot. All three of them have always been very close and are usually found hanging out together. Very glad to hear that Indra’s improving and hope this continues. How lovely that Hera and Sweet Pea are staying as close by as they can get! Over here in England, town vets have absolutely no idea about chicken problems, despite the fact that more and more people are keeping chickens in urban areas. I’ve found a rural vet, just a few miles away, who keeps chickens himself, which is useful. That’s how it is over here, too. Clint’s actually a vet, and I hate to say it, he knew less than I did about chickens when we got our first ones and at times I still get to teach him something about them. I think most vets are mainly exposed to info about broilers while in vet school, and the average backyard chicken experiences health problems that a broiler won’t in their short life. It’s sad, but there’s just so much more money in treating dogs & cats instead of farm animals, & most vets, over here at least, graduate with a lot of debt nowdays. I guess the farm vet has sort of become a dying breed.